With the launch of egX, the Eurasia Group family now provides the marketplace with a complete political risk solution. Within this integrated universe of offerings, each component draws upon and reinforces the others to create synergies for our clients. This multi-faceted approach reinforces Eurasia Group as the premier partner for globally-oriented organizations amid a rapidly changing geopolitical environment. egX is a platform that crafts innovative approaches to the world's most complex global political challenges. We accomplish this by leveraging the breadth of qualitative expertise within Eurasia Group and our proprietary data-driven tools, as well as a broad array of external political experts through strategic partnerships. We identify and align the most relevant producers and consumers of political risk analysis to solve complex problems. A client can come to us with any geopolitical challenges they are facing in the global economy, and we will deliver an integrated and cross-cutting solution. A quantitative and data-driven approach is the hallmark of the egX platform. Data analysis has become a crucial tool in gauging political risk with the amount of data and ease of access expanding exponentially. Similar to the historic development of electrification that enabled the industrial revolution, today datafication is revolutionizing business. We are harnessing this new force through our internal innovation lab as well as by partnering with the top firms in the big data space. Nikko Asset Management: Nikko integrates Eurasia Group's proprietary approaches to quantifying political risk into portfolio allocation and risk management. KPMG International: KPMG works closely with Eurasia Group to design scenario planning and risk management solutions with implementation capabilities. A range of public relations, due diligence, and legal service providers that we work with in order to present a one-stop politics first solution to both their clients and ours. 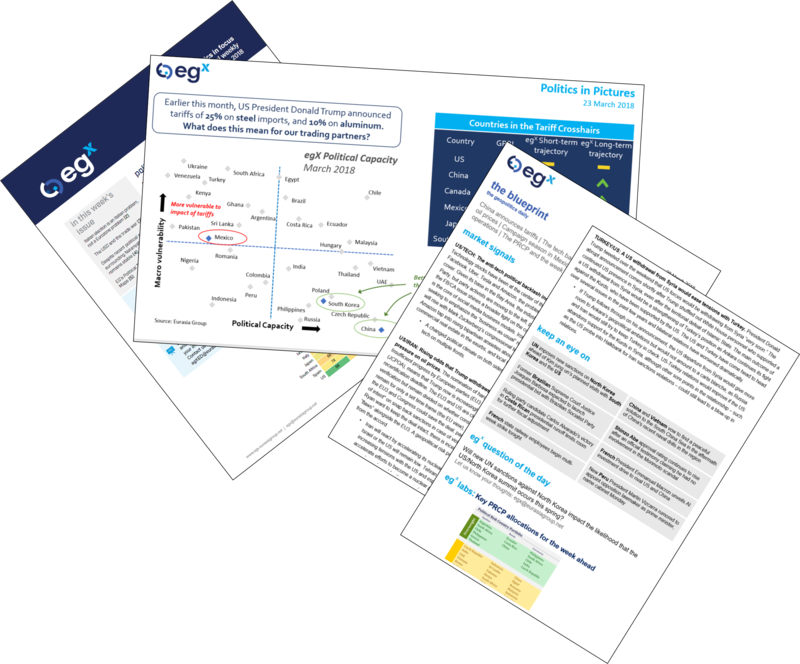 The egX team sits at the crossroads of geopolitics, markets, and data. The team members bring together a wide range of professional experience in political science, financial markets and currency strategy, portfolio management, quantitative research, wealth management, consulting, policy, non-profit, and technology among other areas.